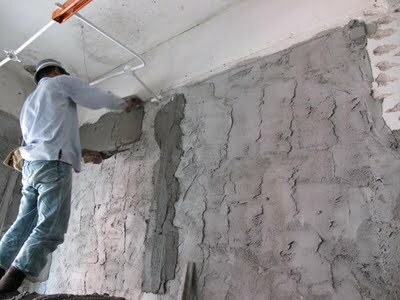 Plastering of concrete surface is the application of lean mortar to enhance the appearance of the surface. Different methods are used to plaster concrete surfaces such as dense concrete, low-weight concrete and mixed concrete surfaces. Fig 1: Plastering of concrete wall. 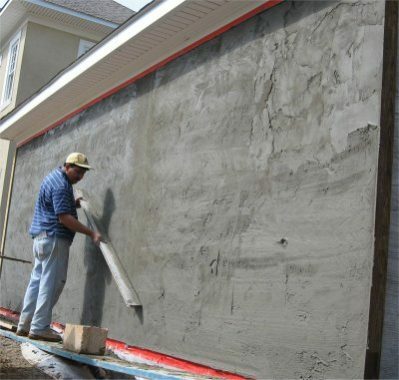 In this article, we study the general procedure for plastering on concrete, plastering on different surfaces, and safety requirements for plastering work. Prior to the plastering work, the surface of the concrete to be plastered is to be cleaned from peeling paint, flaking bits of old plaster and should be free from paint, oil, and dust so that the plaster can bond properly. The texture of the concrete wall must be rough enough to hold the plaster. To achieve this, a slurry is applied on the concrete surface. Slurry or dash is prepared by mixing 1 part cement to 1 and 1/2 parts coarse sand with the quantity of water sufficient to obtain a runny consistency. A suitable amount of fine aggregate (sand), cement and water are mixed to obtain a required consistency of plaster for the desired work. The prepared plaster must be used within two hours. A base coat of plaster is applied over the layer of dash with a steel trowel. The layer should be in the range of 10 to 15 mm thick. Apply it in small strokes, making sure it is level and uniform. If the plastering is done in only 1 layer then the thickness of the plaster must be not more than 10 to 15 mm. Remember the thickness of the top coat should be 5 to 10mm. Once the plaster is hard and set, curing must be started and continued till 7 days. After the plastered concrete walls have dried, you can paint them or apply wallpaper. The thickness of the undercoat used in conjunction with Thistle Bond-it or other bonding agents should not exceed 11mm for walls and 8mm for soffits. The thickness of the finish coat applied over the undercoat should be 2mm. In areas where greater thicknesses are likely, it will be necessary to apply the plaster over expanded metal lathing fixed mechanically to the concrete. Fig 2: Plastering finish on concrete wall. As the dense concrete has low porosity and smoothness, plastering does not adhere to the surface. To treat this problem, reference is made in Section 4 of BS 5492: 1990 to the use of bonding treatment on dense concrete backgrounds due to the low porosity, little suction and the absence of a mechanical key on such surfaces. Preparing the surface of concrete mechanically by scabbling or shot blasting will remove any contamination of the concrete surface and roughen a smooth surface. Such treatment may help to improve adhesion of the plaster but will not increase surface absorption and alone may be insufficient to prevent failure. Concrete should not be plastered until it has had a reasonable time to dry out after the shuttering has been struck. Plastering should certainly not commence if free water is present on the surface of the concrete. On most new building sites, however, it is not practical to wait until the concrete has attained an air dry condition as this may take many months or even years in the case of very thick constructions. Probably the most risk-free option of plastering concrete is to apply the plaster to expanded metal lathing plugged and screwed to the concrete. A disadvantage is that the method can be expensive. Fully compacted lightweight aggregate concrete has a different thermal movement value to plaster and, when hardened, can present a dusty surface with high suction. These conditions can present difficulties when plastering and bonding treatment such as a PVAC bonding agent or Thistle GypPrime may help. GypPrime prevents the rapid dehydration of undercoat plaster that can happen with high suction backgrounds. Apply Thistle GypPrime thinned with water depending on the absorbency of the background using a suitable roller, brush or spray. It must be completely absorbed and that no shiny film remains on the surface. Commence plastering once it is completely dry. A no-fines concrete is, on the other hand, an ideal material to plaster. It has many large voids and offers an effective key for plastering. When plastering is to be continued across different backgrounds, expanded metal fixed across the junction will minimize cracking due to differential movements. Where small widths of one material are involved, for example where a concrete column divides brick panels, the column width is best bridged completely by fixing expanded metal over building paper onto the abutting brickwork in order to isolate the plaster from differential movement. Alternatively, where cracks can be expected to form in the plaster over the junction of dissimilar materials, a straight knife cut through the plaster along the line of the junction will prevent the formation of unsightly irregular cracking. Back to back beads may be fixed over the junction instead of making a knife cut as shown as in the below figures. Fig 3: Metal mesh on building paper spanning over junctions. Fig 4: Controlled crack line. Avoid plastering concrete where possible. Where possible, use concrete mixes containing flint aggregate for areas to be plastered. Use a light application of a chemical release agent in preference to mould oils. Make sure the concrete surface is checked for contamination and appropriate action taken. Remove surface dust from dense concrete surfaces and apply a proprietary bonding agent such Thistle Bond-it. Consider using GypPrime on absorbent backgrounds. Apply the plaster with firm pressure and, once hardened, check for the development of hollowness as the plaster dries out and when heating the building for the first time. Try to avoid heating the building suddenly, increase the temperature gradually. Ventilate the area of work. If dust cannot be controlled, wear a half face mask to EN 149 Class FFP1. Wear impermeable gloves, protective overalls and safety footwear to avoid prolonged or repeated wet contact. Apply a barrier cream to the hands to reduce the effect of skin contact. Wear safety goggles to BS EN 166 type 2A5 if plaster powder or splashes are likely. BS 8000-10: 1995 Workmanship on building sites. Code of practice for plastering and rendering. BS 5492: 1990 Code of practice for internal plastering.